The Apprenticeship Levy is ‘not a stealth tax,’ a leading expert has said as the deadline draws closer to British business missing out on a collective £2Bn-plus in contributions. Addie Marks of Jonathan Lee Skills Consultancy offers free and impartial advice to businesses on how best to utilise the Apprenticeship Levy and believes the monthly payments should be viewed as an opportunity for companies to address their skills shortages. Since April 2017, any company with an annual employee wage bill in excess of £3M has been required to make monthly payments to the Apprenticeship Levy, an initiative launched by the government to encourage employers to invest in training. Figures revealed by the National Audit Office in March showed UK employers had deposited £2.2Bn into the Levy in 2017-18, but a mere nine per cent of the total has been accessed and reinvested in staff training and development programmes. 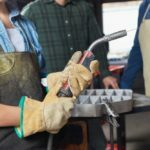 Businesses can draw the total value of their contributions to fund apprenticeship schemes through recognised training providers within two years of the payment dates; any money not accessed within that timescale is lost to the Exchequer so the first contributions will be forfeit from April 2019. Marks said: “We have spoken to a number of business leaders in recent months and the recurring theme is a lack of clarity and understanding of both the Apprenticeship Levy and apprenticeships in general. “There is a widely held misconception that the Apprenticeship Levy is a stealth tax which offers no benefit to their business model. Too many companies are paying into the Levy and getting nothing in return. In the majority of circumstances, Apprenticeship Levy funds can be used to finance all of the training needs of a business; not just those of entry level employees. Despite this, Jonathan Lee Skills Consultancy is discovering that many employers are spending vast amounts on commercial training whilst simultaneously paying six or seven figures sums into the Levy. The perception of apprenticeships is also outdated, Jonathan Lee Skills Consultancy experts have found. Marks explains: “The term ‘apprenticeship’ can be off putting for employers. They perceive the new system to be heavily bureaucratic, to lack access to directly relevant accredited courses and to be available only to school leavers. “Apprenticeship Levy funds can only be used on apprenticeships, but this terminology now covers a very wide spectrum of subjects, specialisms and levels, some of which are equivalent to a Masters degree. The Government is bringing out new frameworks and programmes on an almost daily basis and our role is to educate employers in understanding the new system and how to use it as a vital training tool. “We also hear concerns from employers about the need for off-the-job training, fearing they will lose their staff for one day a week to college. That is also far from a reality under the scheme; learning can be delivered in the workplace or in virtual classrooms so impact on productivity is minimal. This case shows the critical importance of clearly identifying the scope of works.